Voting against Trump, of course, is the main message of the Democratic Party and even the Hillary Clinton campaign itself–all along, Clinton has been looking forward to campaigning against whatever monster the Republicans nominated, rather than putting much positive forward. Thus, DeMoro is telling you to vote for Hillary Clinton. THIS CONTRADICTORY dynamic–emphasizing the need for militant social movements and radical change while at the same time pleading with activists to remain committed to voting for the Democratic presidential candidate most attendees opposed during the primaries and to working within the Democratic Party–was a running theme over the course of the weekend. At times, the speeches from the front at the People’s Summit were quite radical. “We live under a system of exploitation based on private profit and greed,” DeMoro said in her opening speech. “The problem is neoliberalism: Austerity measures. Privatization. They’ve turned everything into commodities to be sold.” That certainly is nothing like the humdrum lines about “building a strong middle class” that many union leaders cling to. John Nichols, a columnist for the Nation, drew roaring applause when he expressed excitement about the fact that “millions of Americans today are embracing the “s” word”–the “s” word, of course, being socialism. Others aimed their criticisms directly at Hillary Clinton and Democratic National Committee (DNC) Chair Debbie Wasserman Schultz. For example, Dominque Scott, a student activist with United Students Against Sweatshops, pointed out in one session that “Clinton has done massive amounts of harm to poor folks, to black communities…She supported massive increases in incarceration. I am deeply distraught by the two options available to me in the presidential election. Trump and Clinton don’t represent me.” Her remarks drew a standing ovation from the several hundred-strong audience. BUT FOR every bold statement in defense of movement-building and militant protest, most speakers attached a caveat: build the movements, sure, but also make sure to vote and participate in the electoral arena. And while it wasn’t explicit every time, the obvious implication of this argument was, in most cases, that movement activists, in order to achieve their goals, should work within and through the Democratic Party. The strategy put forward emphasized electing “Berniecrats”–Democrats sympathetic to Sanders’ message and proposals–in down-ballot elections, on the one hand, and going to the DNC to demand progressive reforms to the party platform, on the other. The goal of both tactics is to integrate Bernie Sanders supporters into the Democratic Party so that they might attempt to transform it from within. Because of this emphasis, discussion of the Green Party candidate for president, Jill Stein, was conspicuously absent. Generally, speakers at the front studiously avoided talking about any possibility of breaking away from the Democrats and supporting any party, either the Greens or a new formation, that would contest elections to the left of the Democrats. Some people explicitly opposed such a strategy. For example, Bob Master, of the Communication Workers of America–the biggest labor endorser of Sanders–and the Working Families Party in New York, argued that it was “overly ambitious and counterproductive” to try to build an independent party to the left of the Democrats. The priority, Master said, should be supporting Democrats, not only in 2016, but in the 2018 midterm elections. In another case, at a breakout session for activists based in California, members of the audience asked why there was no debate about whether to support Jill Stein, but were rebuffed by the official moderator, who offered soft support for Clinton. BUT ALTHOUGH conference organizers didn’t want to entertain such questions, many participants were very eager to discuss and debate them. Over the course of the weekend, scores of conference attendees stopped by the International Socialist Organization’s (ISO) booth and expressed a strong aversion to falling in line behind Clinton. They were eager to talk about how to build a new political vehicle, separate from the Democrats, that could fight for some of the key planks in Sanders’ campaign platform, such as single-payer health care, tuition-free college education, and a $15 an hour minimum wage. 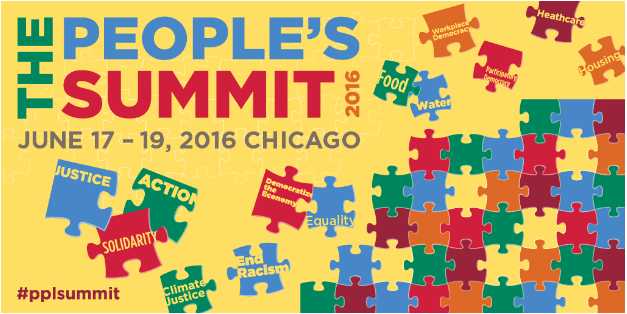 Some expressed frustration that the People’s Summit wasn’t devoted to doing just that. Indeed, the well-funded, well-attended and smoothly organized event might have seved–in a not too distant, but different world–as a preparatory step toward building a new third party of labor and social movements. Although this obviously wasn’t the purpose its organizers intended for it, what was on display at the sessions and among attendees at the People’s Summit showed that independent politics is financially realistic and organizationally feasible–but only when we can amass the forces to lead labor and other social movement organizations to break from the corporate-funded Democrats and strike out on their own. 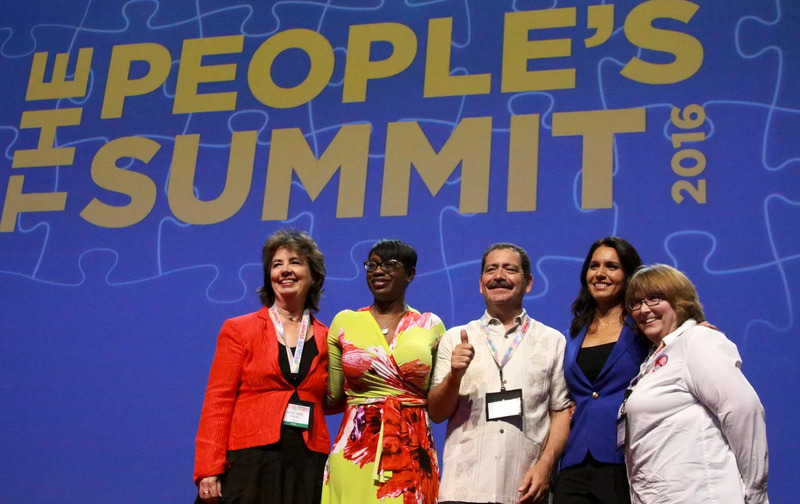 Unfortunately, organizers of the People’s Summit seem to have had the opposite goal: to channel the dissatisfaction with the status quo that drove Sanders’ populist vision and redirect it into an effort to work squarely within the Democratic Party. Sanders’ senior adviser Becky Bond described the goal of this strategy as “doing to the Democrats what the Tea Party did to the Republicans.” But while the Sanders campaign has thrown up plenty of contradictions that the leaders of the DNC would rather sweep aside, we must also come to terms with the other side of the coin: to the extent that the “don’t leave the Democratic Party” strategy wins out, the Sanders phenomenon may leave the Democrats with a stronger grip on labor and progressive activists–in the short run, at least–than it had before. Plenty of activists at People’s Summit saw this contradiction for what it is. Over the course of the weekend, organizers at the ISO table collected dozens of signatures to get Jill Stein–who stated on Twitter that she was barred from speaking at the event–on the ballot in Illinois. Many other people purchased paper editions of Socialist Worker and signed up to get more information about getting involved with the ISO in the various cities. When asked, lots of people said they were happy to identify themselves as a socialists–which provided numerous occasions for discussions about exactly that label means, how social democracy differs from socialism, and so on. This collision of contradictory forces–pushing left in favor of demands like single-payer, on the one hand, and pulling right to try to corral wayward progressive activists back into the Democratic Party fold on the other–presents the socialist left with an important opportunity. A huge layer of activists who were moved into action by Sanders’ call for a “political revolution against the billionaire class” are thinking about what to do now that his campaign is over. Many of them are disgusted with the Clintons and the way the DNC and the corporate media stymied Sanders’ campaign at every turn. As we saw firsthand last weekend, a large proportion of this audience is eager to get involved with organized socialists, expand their knowledge of the left, and get prepared for the long haul to fight for a better world. Sanders’ call for a “political revolution” is about to be transformed into a call to vote for the candidate he urged a revolt against. The left needs to find a way to engage and recruit the Sandernistas who are not ready to give up the fight.